How T3D earned more than 30 press coverage in one month with SparkAmplify‘s influencer marketing solution. Identify 3D printing-related influencers, earn social proof with press release and drive more traffic to Kickstarter campaign page. T3D is a Taiwanese tech startup with zero experience in marketing. They faces challenges many company faces, “How to identify the right influencers, especially in foreign countries in a limited time?” Anxious and worried, T3D came to SparkAmplify for help. T3D is a 3D printer manufacturer in Taiwan, which created the world’s 1st mobile 3D printer that can turn your mobile devices into a fully functional 3D printer. To emphasize the brand message and attract as many potential backers as possible for the crowdfunding campaign in limited time, T3D chose SparkAmplify among many in uencer marketing platforms. SparkAmplify helps T3D achieve their goal in identifying and connecting with 3D printing, tech and gadget influencers, resulting to more than 30 press coverages and a extraordinarily successful campaign in one month. With SparkAmplify’s assistance, T3D created an appealing Brand Profile on SparkAmplify’s platform, which attracts media influencers to tell T3D’s story easily. T3D chooses categories that represent their product to precisely identify relevant media influencers. Categories T3D selected includes 3D printing, additive manufacturing, mobile accessory and other technology categories. 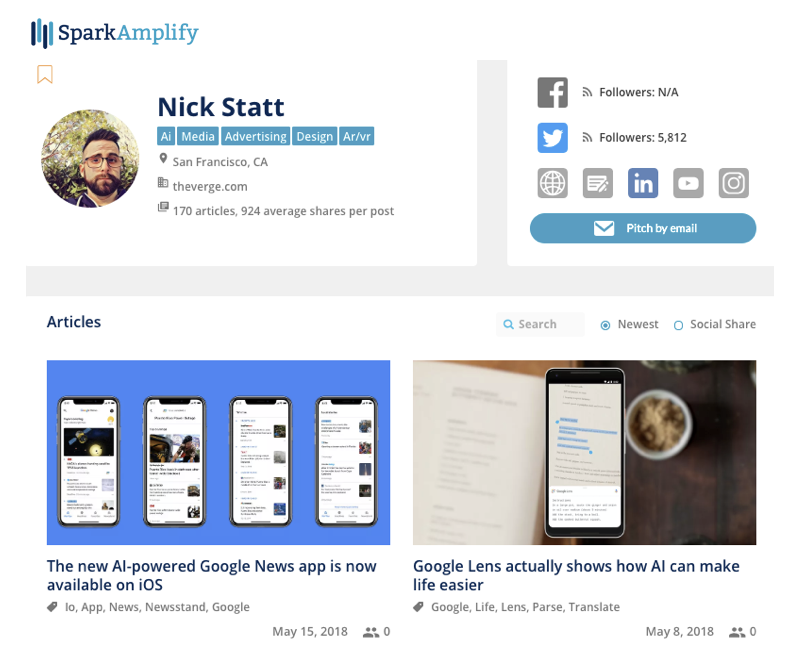 A list of related media influencers is then automatically created on SparkAmplify’s Connect Page. 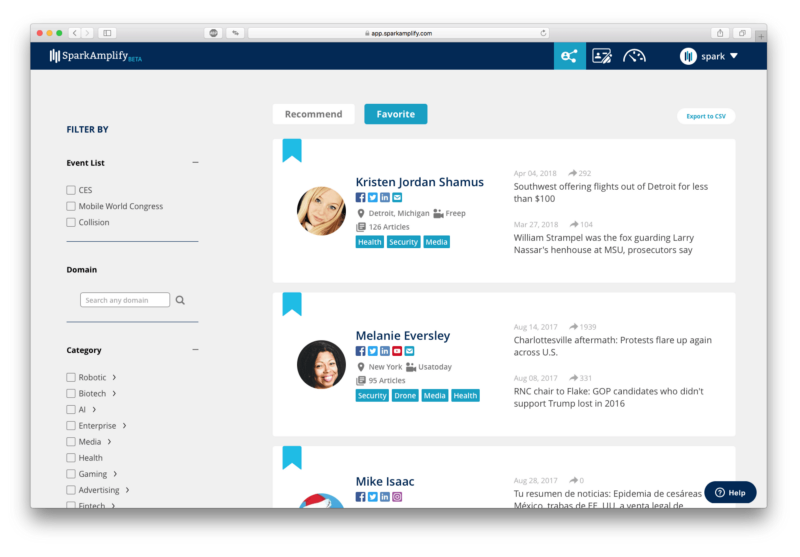 Lastly, T3D visits each influencer’s Media Profile to add interested media to their favorite list. After creating the list, they are all set to start the media outreach! By the end of T3D’s crowdfunding campaign, T3D has 257% pledges beyond the original goal. 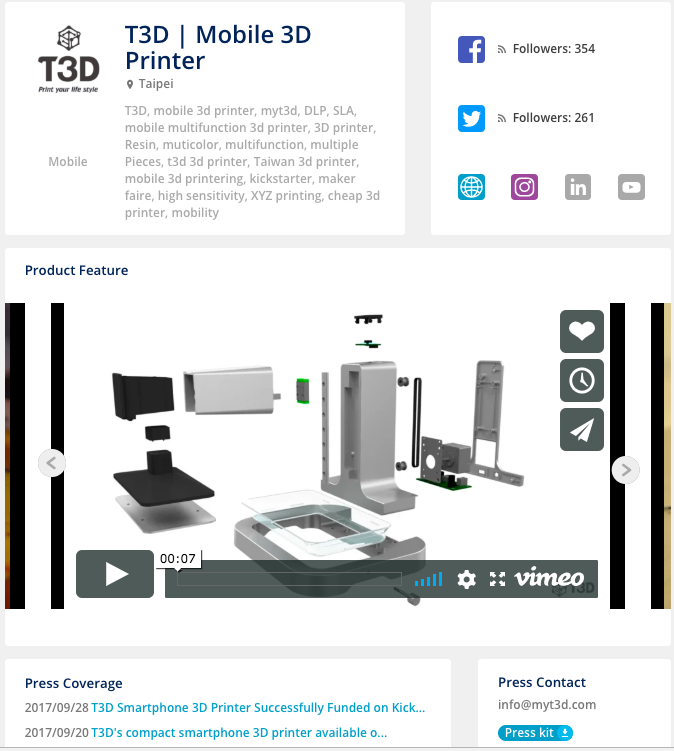 Many essential 3D printing industry experts and tech media are raving about T3D’s revolutionary mobile 3D printing solution and their extraordinary campaign. Some of the 32 articles released in one month, includes press coverage from Digital Trends, Engineering.com, Core77 and 3Dprint.com. T3D earned a total of monthly unique traffic over 104M and 2K+ unique visitors on the Kickstarter campaign page.